Dawn at Frugal for Life put out a call to share ways to save money. I couldn't resist this one, so here are the top 25 ways we save money. We live in a smaller house than we can afford, and do a lot of our own home repairs and painting. p.s. Though we weren't thinking about it at the time, living in a smaller house gave me the freedom to quit my corporate performance and process improvement consulting work and become a Life Coach, Gifted Adult, Creative Personality, ADHD Coach, and Mentor Coach to Professionals and Self-Employed people seeking to enhance time management, productivity and work performance while also improving relationships, and reducing stress, overwhelm, clutter, indecision and exhaustion. Pay bills online with a free checking account from Wachovia (now Wells Fargo.) It also pays us interest on our balances. We don't "coupon." Coupon hunting encourages buying more than you normally would and leads to stockpiling more than necessary. We spend less since I stopped couponing. I believe that spending time, energy and attention couponing exposes you to excessive advertising and inadvertently sets you up for addictive shopping and spending. Think about it, why would businesses put out so many coupons if it didn't help THEM make more money. Because they know it gets your attention...and once they have that..it's MUCH easier to get you to spend money on their stuff. We avoid using ATMs that charge fees. We changed all our lightbulbs to compact flourescent bulbs including our front porch and outdoor lights. We turned our front lawn into a perennial, drought resistant garden with paths and a table with benches. No watering, chemicals or lawn service. Just mulch it a little twice a year and prune. We use an Amazon.com Rewards Credit Card. We put all daily living purchases on it and pay it in full every month. 2011 UPDATE- We are rethinking this strategy...every time we use credit card the business owner has to pay the credit card company 2 - 4% of every purchase. Not sure I want to reward the Credit Companies that way. So now, we try to use checks or cash when paying small business owners. We use a Miles One Rewards credit card for all business purchases and get free miles for traveling. We've gotten 2 tickets free that way. Don't go to movie theaters anymore - we wait for movies to come out on cable. We use Tivo to record movies we really want to see. We rarely eat in restaurants or get takeout maybe once a month or even 2 months. We cook healthy fresh food at home every day. In 2010 we even started growing our own veggies. We only run the dishwasher and washing machine when it's mostly full. Only drink water, coffee or tea...no sodas, etc. We moved our car insurance to Geico last year and saved $1500 per year. Northern NJ has nearly the highest insurance rates in the country. We couldn't believe we saved this much. And our insurance rates have actually gone down every year! Probably because my car just keeps getting older. We also have a huge collision deductible which also keeps rates down. I cut my husband's hair myself. I mostly only wear lipstick and blush. Only use full makeup when I'm teaching on video or going to an event. Don't buy jewelry. Only wear a watch and wedding rings. Jewelry on my neck, wrists or ears causes me a lot of discomfort anyway. We saved a lot of money on our wedding rings with just simple bands. We put our money into the down payment on our house instead. Do my own pedicures and go out for a pedicure maybe once a year as a treat for a special occasion. Do my own manicures...and I don't use nail polish on my fingernails - it saves a lot of time too. We rarely throw any food anyway. Have a system for storing leftovers and USING them. We have a tray in the fridge on the top shelf and always put leftovers there and then use them the next day or 2 for lunch or snacks or as a side dish with dinner. We have a small Cuisinart counter-top convection oven for heating and baking small portions instead of firing up the stove. I've only bought one brand new car in my life. Cars only depreciate so I never saw the point in losing a few thousand dollars as soon as you drive it off the lot. But I did finally splurge on my 40th birthday and got myself a 2000 Sebring Convertible which I will keep as long it is still safe to drive. I love it. It is actually very practical as we can open the top and haul just about anything an SUV can. We don't buy CDS or DVDS. We download music. 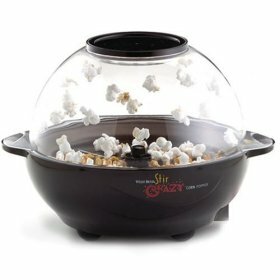 We avoid processed foods like microwave popcorn, we use the bulk kind and have a West Bend Stir Crazy popcorn popper. Like this post? Sign up for my free AgiliZen ezine and get my free AgiliZen toolkit which includes my free e-book on Simplifying Your Life. Having Trouble Resisting the Urge to Splurge? Sometimes all it takes is the right question! Using what you have to get organized without spending a penny! I hope you'll tell us all about that system you have for making sure that you use your leftovers! "Don't buy CDs or DVDs anymore - we download music - we get 25 songs free every month with our comcast cable internet service. The super high speed internet pays for itself with all the research we do on it." Good for you; someone who actually uses the service for more than just connections. Are you going through Rhapsody? I don't know if it's a local thing...we got a Comcast.net news email over a year ago telling us we could do it ...so we do!! : ) Call your local provider and find out...it's worth it! "Not Buying It: my year without shopping" by Judith Levine is a great read for people interested in living more frugally. She and her husband decide not to purchase anything but the essentials for a year. She goes through the year in diary fashion and weighs all of her decisions and lapses. Re: #12, I guess this one is kind of obvious, but - why buy water at all? Get a Brita if your tap water tastes bad, and pick up a Nalgene or sports bottle if you need to carry it, but for heaven's sake don't add to the landfill and to the environmental cost of transporting it from Fiji or Calistoga or where ever. This one may also be obvious - but learn how to cook well, and then only buy produce in season. This also keeps your diet interesting over the progress of the year. USED: in our society you rarely have to buy something new. This includes: furniture, clothing, purses, books, cds, cars, toys, hats, coats, etc. BEAUTY: I say no to high end makeup and hair products. I highlight my own hair every 8 weeks for $8.00. Not counting gas, food and housing, I spend about $30 per week this way and I'm very entertained. One of the biggest things that we have done is furnish our home via garage sales. We have a full size bar ($20) and and dining room set ($25) not to mention the many other items such as chairs that we have gotten well below that cost of buying them new! www.auctionzip.com We've even bought vintage items at some of the estate sales and sold them on eBay for a little extra income. I enjoyed your list. I enjoy sharing and giving ideas that is helpful like this. That is why I started my blog. Thanks for the great info. I loved your list. I already checked off several things from the list that we as a family already do. Organization is a key factor when attempting to save money. I have just recently finished reading Having It All, Achieving Your Life's Goals and Dreams by John Assaraf, and it really helping me organize my thoughts and set a goal for the future. I feel like all the things to save money here and there that I already do have helped tremendously, but know I have the courage to even do more. John inspires and assures you that all things are possible no matter who you are. Thanks for all your tip. I could not have stumbled upon them at a better time, completing John's book and reading your blog. I was wondering if you could correct the link back to http://frugalforlife.com/25-ways-i-save-money/ as that would be very helpful. Thanks! Joy, a rainwater tank sounds awesome... where do you put it? We have a tiny lot and our space would not hold a big tank, but I'm sure a lot of people could. Thanks for the tip! Thanks for the great list. I just wanted to add that we get haircuts at our local cosmetology college. The students are always really careful to do a good job because they're being graded. An adult cut costs $8.50, and they often have coupons in the newspaper. My husband's last haircut was only 6.50! Plus it gives them needed experience. Save money in your home office. A lot of companies sell cheap printers but they are not so cheap!! The cost of owning a printer becomes expensive if you cannot print double sided and if the toner constantly needs to be re-filled..
We just down-sized by buying a smaller home. This past year we have also decided to only eat on special events (birthdays, anniversarys...etc). We were shocked at how much we were eating out, almost once per week. I really enjoyed your list, but you had a few grammar problems here and there. You should spell check before hitting send. Don't buy excess paper products. I stocked up on cheap dishtowels, hand towels, and washclothes and use them for everything(unless the impossible mess!) Spent only $22.00 at a discount store.Cut and color my own hair and never go to stores or malls.No gym--walk when possible. Borrow from library--they even have computers to use! When I take the car out to an appointment ,I co-ordinate trip with errends and grocery stores on the way.Moved to small house and only fill up with oil 2 times a year.Dine out 1 or 2 times a month . Ptobably some of these ideas are repititions but they really help! I'm a Comcast subscriber. How do you get 25 free music downloads per month? PRAY TELL? ?